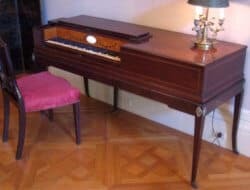 The history of pianos during the Classical era: The Fortepiano was a relatively small instrument with a small sound, but during the Classical era it became very popular and eventually replaced the Harpsichord and the Clavichord. What happened musically during the Classical era had a huge impact on the development and the rising popularity of the new instrument; The Pianoforte. The orchestra expanded. The classical orchestra now had up to 40 members. Together with other composers of the era, Mozart, Haydn and Beethoven wrote piano concertos. This meant that the Forte Piano had to be improved so it could be heard over the now larger orchestra. 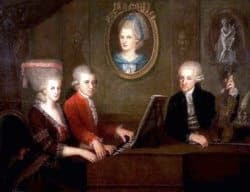 Nannerl, Wolfgang Amadeus and Leopold Mozart (Dad) at the piano. Interesting Fact: Mozart wrote piano compositions for pianos with about five octaves. The Square piano or "Tafelklavier" was invented by Johannes Zumpe in England in 1766. This was another important invention in the history of pianos. The square piano was a popular instrument also because of its practicality - close the lid and you had a table; a real space saver! 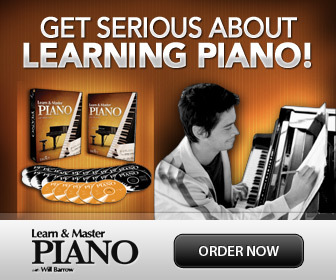 It paved the way for the first upright pianos during the 19th century. The pianos had found their way into the homes of a rising middle class, and more and more pianos were built. L.van Beethoven (1770–1827) wanted more. He became infamous for breaking the strings all the time- probably because of his impending deafness- but not only, he craved big contrasts, louder sounds, and the poor Fortepiano, or "Hammerklavier" as he preferred to call it, just couldn't handle it. 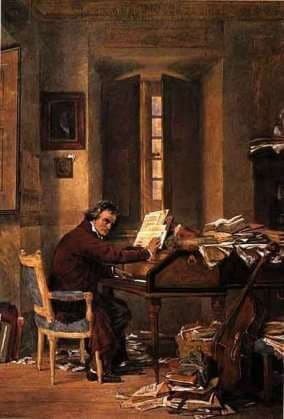 The piano works of Beethoven show us how the range of the piano keyboard kept expanding, since his last piano compositions have a range about six octaves. With the piano, and especially with his 32 Piano sonatas, Beethoven explored and expanded the borders of what was possible- and not! Some of his sonatas has a suggested range that is both higher and lower than what existed on most keyboards at that time! Talk about a visionary!